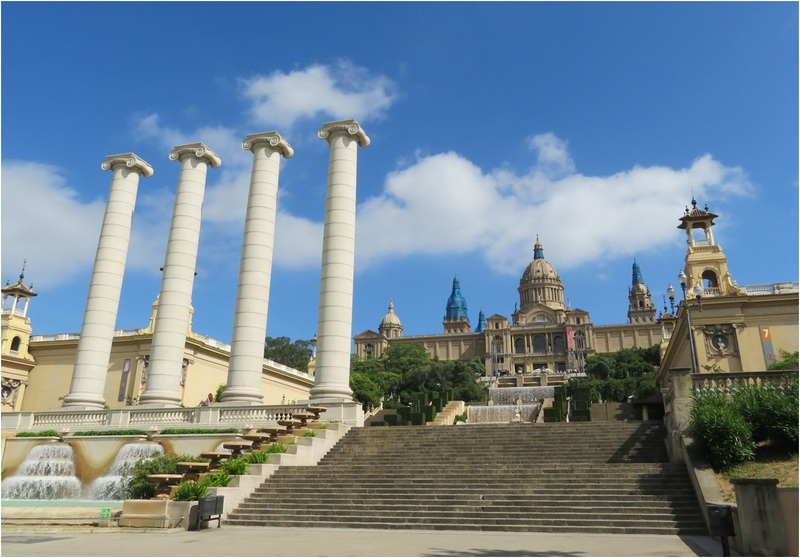 The train from Montserrat arrived back at Plaça d’Espanya in the middle of the afternoon and this was our chance to take a look at another famous district of Barcelona – Montjuïc, a flat top mountain area which overlooks the port and the city. 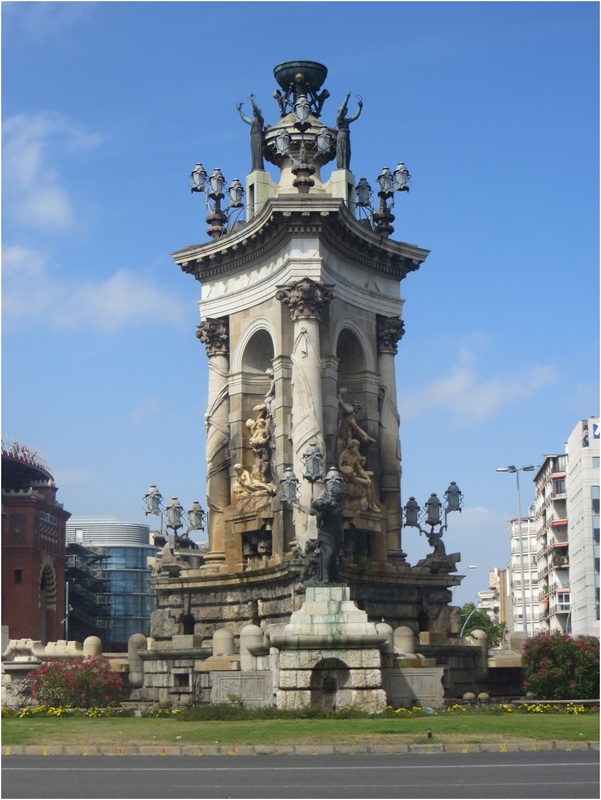 The Plaça d’Espanya was included in the plans for the expansion of Barcelona in the mid-nineteenth century and was laid out with wide boulevards and six main roads all converging on the centre of the square where there is a monumental statue surrounded by a Baroque colonnade. It was completed in 1929 on the occasion of the International Exhibition which was held in this area of the City. The statue at the centre is designed as an allegory representing all of Spain. Three sides with sculptures that symbolize the three principal rivers of the Iberian Peninsula, Ebro, Guadalquivir, and Tagus, around the central sculpture, three decorated columns which symbolise a Spanish/Catalan self-assessment of the qualities of themselves as a Nation – Religion, Heroism and Arts. The Plaça d’Espanya is a busy roundabout, on one side is the old bullring, now a shopping centre (because bull fighting is banned in Catalonia) and on the other are two bell-towers known as the Venetian Towers, on account of the fact that design and construction was heavily influenced by St. Mark’s Campanile in Venice. 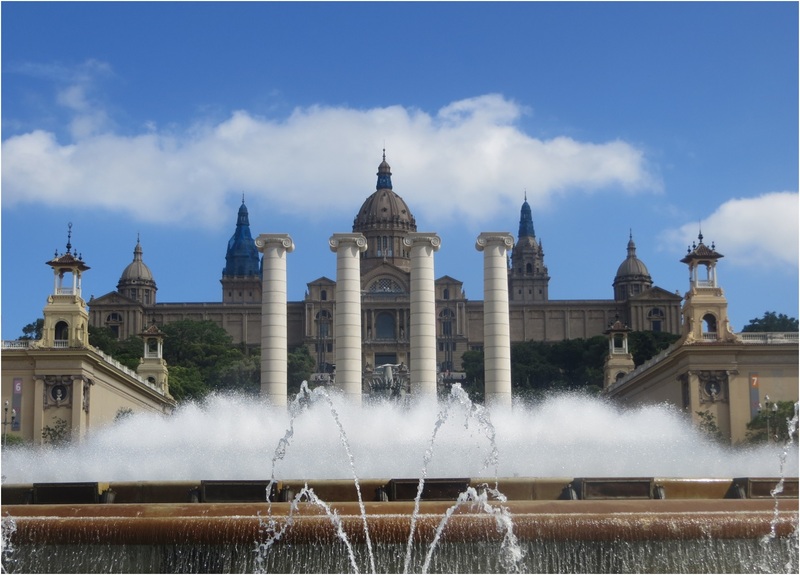 From there a walk up a gentle gradient towards the imposing structure of the Renaissance style Palau Nacional, built in 1929 as the main exhibition hall and today The National Art Museum of Catalonia. This is a lovely part of Barcelona that has a national and international ambiance with architecture borrowed and copied from across Europe and with buildings designed to give a representation of all of Spain. A shame then that large areas of it were destroyed in the calamitous Spanish Civil war of 1936 to 1939. Fortunately everything is now rebuilt and restored in the original style. To illustrate this, at the centre of this Spanish showcase, next to the Palau Nacional, is an attraction called Poble Espanyol, built in 1929 and still there now as a tourist attraction. I found it to be a rather odd sort of place that aspires to celebrate the various regions of Spain but, for me anyway, failed to effectively capture the spirit of the country and it isn’t really a museum but rather a collection of shops and restaurants claiming to sell and serve regional specialities. For anyone who has been to Disney World EPCOT World Showcase you will probably know what I mean. The Disney view of the World doesn’t include Spain in the World Showcase, which is an oversight if you ask me, but if it did then something like Poble Espanyol would be exactly what it would most likely look like. An interesting thing about the attraction is that it claims to introduce the visitor to the heritage and culture of each of the Autonomous Communities of Spain and yet it only showcases fifteen of the seventeen and as we left I couldn’t help wondering why the Canary Islands and La Rioja didn’t rate a mention or at least a shop? So, I have looked it up; apparently the research designers were unable to organise a visit to the Canary Islands for economic reasons and LaRioja didn’t exist as an Autonomous Community of Spain until 1980. We stayed around the area for a while but it was too late to visit the museum or the shops of Poble Espanyol so we stopped for a drink in the park and then made our way back to the metro. 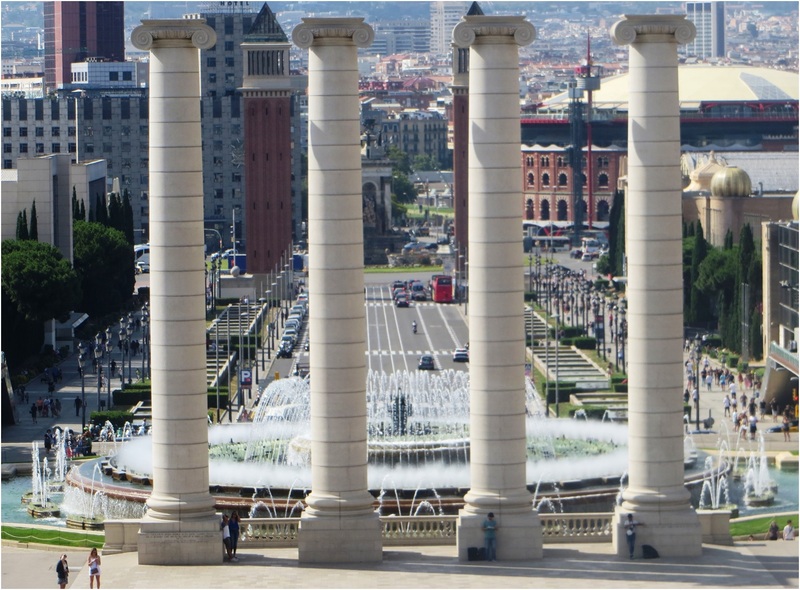 The route took us past a cascading waterfall and four ionic columns originally erected in 1919 to be a symbol of the Catalan Nation and its aspiration for self-governance and independence (the columns represent the stripes of the Catalan flag). The originals were demolished in 1928 under the orders of Madrid but were rebuilt in 2010. I understand the symbolism of the columns but to be honest I found them to be a little inconsistent with the area and a bit jarring on the eye. Not so the adjacent Magic Fountain which was providing a fountain display where the water was dancing and leaping into the air with a cycle of changing routines. The fountain was commissioned to replace the four columns in time for the National Exhibition. It is a great spectacle but the best time to see it is at night time when the fountains are accompanied by a light show and music. We weren’t staying close enough to return later (mid-June and not getting dark until quite late) so instead we returned to the same restaurant as the previous evening and instead of the fountain took night time pictures of the Sagrada Familia as an alternative. This entry was posted in Arts and Crafts, Europe, Food, History, Postcards, Spain, Travel, World Heritage and tagged Barcelona, Catalan Independence, Catalonia, EPCOT World Showcase, Montserrat, National Exhibition 1929, Palau Nacional Barcelona, Plaça d'Espanya Barcelona, Poble Espanyol Barcelona, Spain Civil War, World Heritage. Bookmark the permalink. That three sided sculpture looks very interesting, I’d have been tempted to take some close ups of the carvings on each side and do a complete post on it! It would have been rather perilous to cross those roads to get to it! If I had one powerful enough! That’s a beautifully composed picture of the man and the boy. Excellent! Not especially busy that day! And both do not fit well with the current trend in Catalunya but it does represent the whole of Spain in their city. Plaça d’Espanya is where I stayed the last few years when visiting the city, again in october by the Fira congress hall nearby. It is a complex issue that is for sure! Thanks for the contribution. A fascinating part of the city of Barcelona. Thanks.
. . . those columns look like they should have something atop them . . . either a cross-beam or individual statues. Exactly, they seem to be waiting for someone to finish them off. They are completely out of place in my opinion. 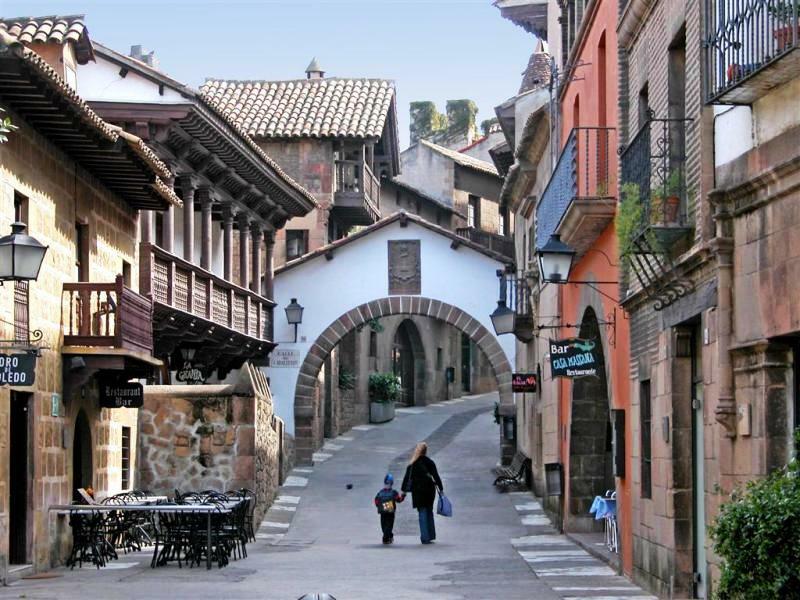 I do like that image of Poble Espanol….just the two figures….my kind of image!! My son is just back from Barcelona and waxes lyrical about the lights and music around the fountain. I have seen it myself but that was over 25 years ago. Interesting post. Thanks. The fountain is a magnificent sight even without the lights. I need to go back when days are shorter or get accommodation close by! Quite so Jo, if we miss something it means we see something else instead (Confucius says)! I’m beginning to think you’ve lost your passport, and are stuck there, or are on England’s Most Wanted list! Back to Blighty for the next post sequence – Suffolk to be precise!